We are pleased to launch our latest products to the Native styling and grooming range. The Native AM/PM beard oil ranges crafted by British Barbers are the result of a year long journey to create the best beard oil available. Created to lovingly care for, moisturise and nourish both your beard and skin using the best ingredients that includes the finest blends of Argan Oil, Jojobo Oil, Coconut and Sweet Almond oils combined with the perfect scents. We decided early on in the process that we would focus on developing one superior beard oil that combined the very finest ingredients available. We then decided to create just two scents for these that covered the two most important parts of the day. 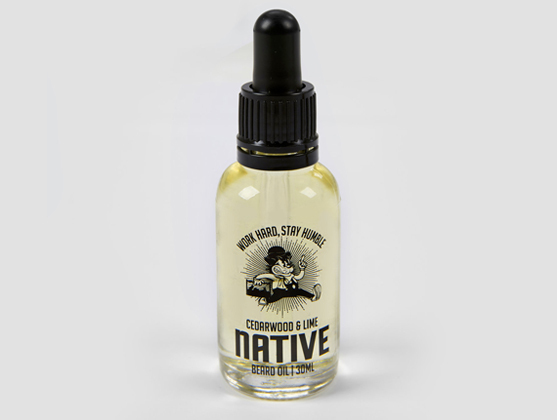 Native A.M Beard Oil has a refreshing Cedarwood and Lime fragrance that works best applied first thing in the morning and gives a perfect kickstart to the day. Native P.M Beard Oil whilst maintaining the same properties as the Native A.M beard oil is a whole different ballgame, our Masculine Signature Cologne is perfect to apply before an evening out.